When it comes to fasting books it feels like a wide range of fasting methods are being covered. Each book has it’s own special take on how we should be fasting and how long we should be fasting. To help you go on healthy fasting, here is my list of the top best fasting books. If you are interested in the scientific research behind the use of intermittent fasting for weight loss then you should find this book to be both up to date and accurate. Of all the fasting books on this list, Eat Stop Eat offers the simplest solution for weight loss. 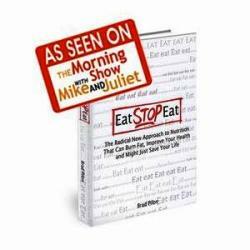 Eat Stop Eat has been featured on national television and helped thousands of men and women around the world lose fat without sacrificing the foods they love. Brad Pilon is a nutrition professional. His graduate studies was about nutritional sciences specializing in the use of short term fasting for weight loss. 3 powerful protocols for fat loss, body recomposition and lean mass gain – All based around the intermittent fasting approach. This uses a 16-hour fast, 8-hour feed strategy to maximize fat loss and muscle gain. Free spreadsheet for calorie and macros too! This specialised Intermittent Fasting Manual was written specifically to help you reach your goals. All of this information is presented in an easy-to-read, straightforward fashion designed to ensure you hit your goals in the quickest time possible. 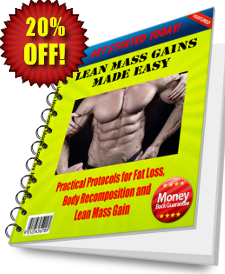 This book is ideal for those who want to lose fat and at the same time gain rock hard muscle. If you are looking for a detoxification fasting diet or to do a colon cleanse fasting, you should pay attention to this fasting book - The Master Cleanse Secrets. Unlike many fad diets of today, the Master Cleanse has survived the test of time for over 60 years. Celebrities and nutrition gurus alike are raving over the immense health benefits and spectacular body transformations that this diet offers. If you are serious about trying the Master Cleanse Lemonade diet and want to be one of the people who do make it through the whole 10 days, the Master Cleanse Secrets book is the most complete guide available for helping you get through. If you attempt to do water fasting and care about what goes into your body and gain better health, this is a must read. Although written many years ago, it was even more relevant in today's world. Dr. Norman Walker was a man ahead of his time! This book covers comprehensively about how to do juice fasting with raw fruits and vegetables while maintaining a nearly normal work and living schedule. It includes juice recipes, detoxification techniques, exercises, weight loss, water fasting and how to break a fast safely. Truly a must read if you want to go on juice fasting. Fasting has been around for thousands of year. It is only during the last hundred years or so, the subject of fasting has undergone close experimental and scientific scrutiny which was probably initiated by the famous physiologist, Dr. Francis Gano Benedict. His book, A Study Of Prolonged Fasting published by the Carnegie Institution of Washington in 1915, is well worth close perusal today. This is a scarce antiquarian,rare and hard-to-find book with something of interest for everyone! From a doctor’s perspective, this book is all about using fasting to lose weight; how to start, what to expect, how to reintroduce food to maintain maximum benefits and also how to work with a physician for longer fasts (more than 3 days). Dr Furhman's powerful message poses a resounding danger to the profits of the food, drug and weight loss industry and some even work feverishly to attack and discredit him. A must read if you tend to go on juice fasting. Coconut water is one of the best juices I recommend for juice fasting. Dr. Bruce Fife serves as the Director of the Coconut Research Center. He is considered the world's leading authority on the health aspects of coconut. He succeeds in educating us about all the health benefits of coconut water, including its detoxing benefits and its ability to cure the cataract of eyes of a person. I lose weight through intermittent fasting. But I’m not saying that intermittent fasting is the best weight loss method. If you look at almost any diet program, you’ll find groups of people who have found success with the plan. They’ve been able to lose the weight they wanted to lose and have been able to keep it off for the long-term. The common denominator here is not the diet programs, but the people following the programs. The reason they’re successful - regardless of the diet plan—is that they have the proper mindset to follow the diet program to lose weight and then most importantly, they stick with the plan for the long-term. I’ve recently come across a book called "THINK! and Lose Weight" to help anyone to develop and sustain the proper mindset to lose weight and keep it off, regardless of the diet program being followed. The book is based on the principles of two of the greatest self-help books ever written - Think and Grow Rich by Napoleon Hill and the Seven Habits of Highly Effective People by Stephen R. Covey. I’m someone who has the experience of changing habit to achieve weight loss. Hence I know it’s true that the habit of choice can change life. So if there is a book which can help people change and build healthy habits, I’m more than eager to recommend. THINK! and Lose Weight is one of such books. I'm going to give you a cool PDF today. It's a sample chapter from the new "THINK! book". It's about the Habit of Choice and it's my favorite chapter. I want you to have it for free and I hope it helps you like it as me. Seek help from any of the fasting books here and start practice intermittent fasting. Need help to develop your fasting habit? Try read the book THINK! and Lose Weight. P.S. My most favourite fasting book is Eat Stop Eat. If you ever need a book to guide you through healthy intermittent fasting, this the top choice.